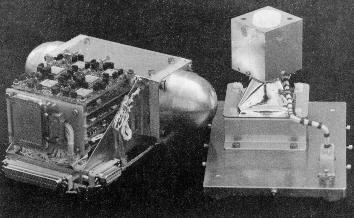 The original proposal to place GRB experiments on the twin "International Solar Polar" spacecraft, as they were then called, was written in 1977. There were to be two identical instruments, one on a NASA Solar Polar spacecraft, and one on an ESA Solar Polar spacecraft. The two missions had trajectories which were symmetric about the Ecliptic plane, and were separated by very large distances for most of the mission. NASA cancelled its participation in the program in 1981, leading to a 3 year launch delay, and the Challenger disaster delayed the launch for another 4.5 years. Launch finally took place in late 1990. The ESA mission was eventually renamed "Ulysses". Considering that little was known about gamma-ray bursts in 1977, the GRB experiment has proven to be remarkably flexible and useful. It has benefited greatly from its omnidirectional response, with no Earth-blocking and almost no satellite-blocking (it is located on the magnetometer boom, far from the body of the spacecraft), as well as from its extremely steady background rate. To date, it has detected 1889 confirmed cosmic GRBs. It has made significant contributions not only to the study of gamma-ray bursts, but also to the study of the soft gamma repeaters and solar flares. Although currently off for power sharing reasons, the experiment remains in excellent health. The Ulysses mission will be reviewed by the Senior Review of the Sun-Solar System Connection division of NASA in late 2005, and a recommendation will be issued in early 2006 which will decide its ultimate fate. Our hope is that it will continue to operate for several more years.